Private woodland management faces a tension between two tyrannies. Isolated decisions of individual private woodland owners risk a tyranny of the small, while the technological resources to overcome this could unleash a tyranny of political and/or technocratic elites. Holistic inquiry was used to synthesize woodland owners? attitudes towards geographic data, the credibility of forest cover data for woodland management and intervention for promoting private woodland management collaboration with the use of geographic data. 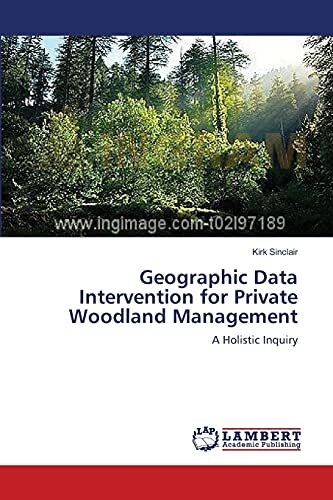 Private woodland owners are receptive to geographic information systems as a means for collaborating with others for their management objectives, but both the geographic data and the means of intervention should be holistically structured to meet their needs. This formative research provides guidance for both private woodland owners and natural resource agencies and agents in pursuit of ecosystem management strategies. Kirk D. Sinclair, PhD: Natural Resource Policy and Management, Cornell University. Proprietor of Community Enterprises.